Set in the midst of World War 2 and interspersed with beautiful choir music, the horrors of the war unfold when the Germans realized one of the boys in the choir is a Jew and they must find him immediately. 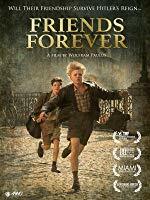 This entry was posted in .AUSTRIA, .film, .GERMANY, .history, .International_Holocaust_Remembrance_Day, .WWII and tagged Blutsbrüder teilen alles, Friends Forever, MOVIE NIGHT, Our Big Time, Wolfram Paulus. Bookmark the permalink.